VR and AR will revolutionise the way humans interact with machines and with one another, says HTC’s Mr Alvin Wang Graylin. Besides smaller and better headsets, compelling content, high-resolution displays and powerful internet networks will drive the adoption of VR and AR technology. The creation of globally accessible virtual spaces will change the way we think about work, education and medicine. Science fiction movies have a prophetic nature to them, featuring ideas that are way ahead of their time. While they may sometimes be overly optimistic about when certain technologies become available, they prompt us to think about the future and what we might achieve with innovation. Steven Spielberg’s upcoming movie Ready Player One looks set to continue that tradition, showcasing a society that has embraced virtual and augmented reality (VR and AR) completely. By donning a headset, alien landscapes become indistinguishable from the real world, and the immersive experience is both snare and catharsis for individuals of this fictional universe. When might these events come to pass? In 2045, according to the book from which the movie is adapted. While three decades might seem like a long time to wait for VR and AR to flourish, the seeds of a reality-warping future have already been planted and are taking root today. Taiwanese consumer electronics company HTC, for example, is blazing a trail in the development of VR and AR technology, with applications that run the gamut from gaming to education. “The metaphor I like to use to introduce VR and AR is a door. In the past, you’ve been trying to look out at a virtual environment through a window. 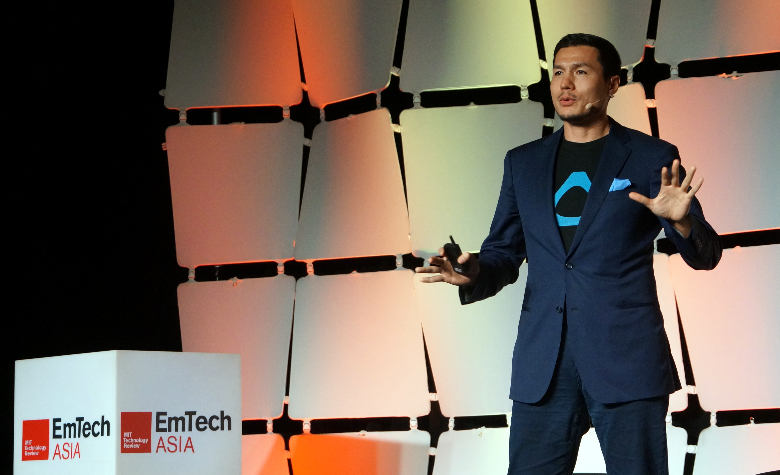 But what you can do with VR and AR is open that door and walk out into that environment,” said Mr Alvin Wang Graylin, China Regional President of Vive, HTC, during his presentation entitled ‘Exploring the Future of AR/VR’ at the EmTech Asia 2018 conference on 30 January 2018. In the present day, our windows into alternate realities are screens—television screens, tablet screens and mobile phone screens. But the screen is just the latest iteration of user interfaces between humans and machines. Every technological revolution that the world has experienced has been the result of a paradigm shift in the way humans interact with the digital realm, said Mr Graylin. “With the personal computer, we went from punch cards to keyboards. Then, with the World Wide Web, hyperlinks were the way that people got access to all the information available on the internet. And just about ten years ago, touch screens came in—a piece of glass was, and still is, your user interface,” he explained. At every step in the evolution of these human-machine interfaces, the mode of operation became more intuitive. Instead of keying in code, you could just click on an icon. Rather than scroll up and down with a mouse, simply swipe and tap to navigate a webpage. Hence, Mr Graylin thinks that VR and AR are the next frontier in helping us connect with computers, and with one other. “Over the next 50 years, I think we’re going to start replacing each one of these screens with VR and AR devices, and at the end of this process, you’ll just have one device on your head that replaces every single screen you have in your lives today,” he predicted. Further sounding the death knell for screen-based interfaces, Mr Graylin went on to highlight several trends driving the rapid improvement and adoption of the technology. The first trend on his list was the advent of easy-to-use, all-in-one products, and HTC’s flagship Vive is one such device. “With the HTC Vive, you put this headset on and you’re in the VR world in two seconds. That’s frictionless VR,” he said, emphasising that there was no need to “stick a wire somewhere or calibrate the device” before using it. But even the best devices lose their lustre without compelling VR and AR content. The development of applications that grant users an optimised immersive experience is thus equally important. Mr Graylin cited the creation of triple-A games (games with the highest development budgets) as key to the sustained uptake of VR and AR devices by the masses. The proliferation of dual lens cameras for 180- and 360-degree video capture in mobile phones also helps in the generation of content, he said. In terms of hardware, ultra-high-definition displays will make VR and AR entities uncannily lifelike. At the same time, the rollout of 5G networks means that headsets can be miniaturised. “All the connectivity and bandwidth issues are removed when you have a 5G network, which means you can get VR and AR devices down to the size of eyeglasses. The processing will take place in the cloud, so all the headset needs to do is perform display and tracking,” said Mr Graylin. As VR and AR devices become smaller, better and more widely used, the very fabric of society may change. Mr Graylin challenged the audience to reconsider the need for offices and conferences when one can simply put on a headset and share a virtual space with colleagues from all over the world. This could in turn have a huge impact on the demographics of cities, as people no longer need to live near their workplaces just to reduce the time they spend commuting. The technology could also overhaul education. “Good teachers are one of the most limited assets we have. Using VR and AR, we can bring quality education to anyone, anywhere in the world.” Mr Graylin noted. On the medical front, VR has been shown to reduce stress and even relieve chronic pain. Not only does this improve quality of life, but also relieves societies of the burden of addiction or side effects arising from the use of powerful painkillers.